Did you know that on the AM band you can broadcast over power lines in your neighborhood? You can’t do that on the fashionable FM band, which is 100 times higher in frequency. The AM-25 is a commercial Ramsey kit selling for under $100. Advertised as a “professional synthesized AM transmitter,” the stock AM-25 may be intelligent, but built by the book this flea-power oscillator is no workhorse. Here are some suggestions for converting the AM-25 into a reliable all-purpose rig for continuous running at practicable levels of power. The modifications include a tweaking of all power functions with a touch of Tesla in the final stage. If you can wield a soldering iron, if you have some electronic kit-building skills, then the esoteric art of AM transmitting is within your grasp. These lower frequencies are more effective, yes, but the size of AM aerials is a big problem. FM is 100 times more compact. For the frequency at which my enhanced AM-25 rig is set, 660 kHz, a quarter-wave wire antenna would be 380 feet long. The typical low-power AM antenna is a compromise having a vertical conductor ten or more feet tall topped with a capacity hat and plenty of radials buried in the ground. A way to use AM without the aerial challenge is by employing “carrier-current” transmission over the power lines. This mode is discussed at length below. The stock Ramsey AM-25 (below) appears to be designed for impotence so that it can function legally as an aerial broadcaster at a mere 100 milliwatts. (It’s advertised as being “jumper settable for higher output where regulations allow,” but that means only one watt.) Of course, considerably more power than this is required for most practical applications. We shall use the smart little AM-25 as the brain of the transmitter, to which we shall add some muscle. The built-in impotence of the AM 25 begins with the power supply provided in the kit, a little wall wart that can’t deliver more than an amp.stock AM 25 Throw it into your junk box and replace it with something that will supply 5 – 10 clean direct-current amps at 12 – 15 volts, like a Triplite PR-7, which I now use (see Parts List below). For my early experiments I used a 12-volt sealed lead-acid battery rated 7 amp-hours, and I guess even an auto battery would do in a pinch. I built the battery into the case along with a charging circuit. The battery’s delivery speed I enhanced with a big electrolytic (25,000 mfd., 30 volts) placed close to, and in parallel with, the power input jack on the back of the AM-25. I don’t use a battery any more, but it’s still good to know that a battery can be used in a pinch. Whatever your power supply, fuse it at 4 or 5 amps and hook it to the AM-25 with short stout conductors that won’t get hot. Inside the AM-25 circuit board itself you may also want to install a larger power-input jack and beef up the associated conductors as well, but I just spliced and soldered heavy lamp cord onto the little 2.1 mm power plug provided. The RF transistor that Ramsey specs for the finall power amp is an MTP-3055 (format: TO-220). I burnt out that one early in my experimenting and replaced it with the NTE equivalent, the 2396. This MOSFET is an N-channel enhancement-mode high-speed switch rated 150 watts, 28 amperes. Get two or three 2396’s, because you, too, will be experimenting. The AM-25 comes with a shallow plastic case, which interferes with the above expansions, as well as with ventilation. You may discard the case entirely or just remove the lid. To facilitate the stand-off arrangement and to enable easy replacement of the transistor, I installed a socket connector that slips onto the prongs of the 2396, rather than soldering that transistor permanently onto the board. As the final solution to all possible heat problems, particularly those which would arise in continuous duty, I mounted a little 3-inch, 12-volt muffin fan (rated 220 MA) where it would put a steady breeze over all of the AM-25’s electronics. The enhanced AM-25 final now could drive a respectable linear amplifier. (That is, it could provide the driving power for such RF transistors as the 100-watt MRF 421 or SD1487.) However, since I was able to pull as much as 21 watts through the enhanced system without any smoke, I did not take that course. Rather I further enhanced the AM-25’s output by conducting it into a Tesla-style resonant “tank” circuit, which is the real final of this transmitter. Any external antenna-type tuner, if tuned to resonance, will provide additional resonant amplification. Hello, Tesla. 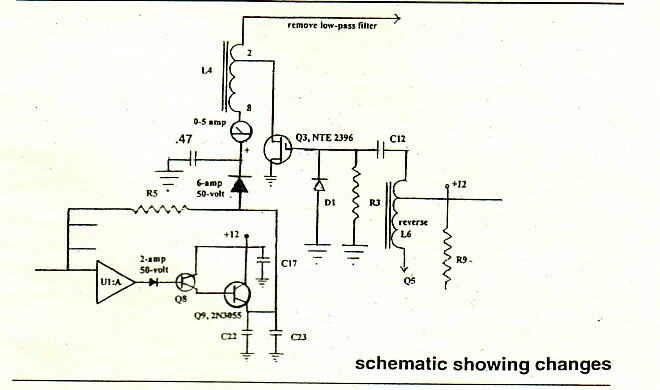 Also, you will be inserting into the audio circuit two new diodes, as described below. The AM-25 is capable of fine audio fidelity, and, if you drive it with a compressor, you can get further enhancement, and range. Dig one up from the audio-musician world, or get from Ramsey a Stereo Companion compressor limiter ($65 kit, $120 assembled), which can be adapted to monaural for this purpose. I audio-mix on a virtual mixer called Audio Station, that I discovered in an HP computer’s audio-utility programs. This mixer has a “3-D” button that gives compression. I have also done a primative mixing on a ghetto-blaster having a karioke-microphone feature and a compression button. My AM-25 came to me already assembled, not by Ramsey (which sells only the kit) but by a reader of my published work who resides in Ohio. George Clark is an electronics engineer, an inventor, and a low-band experimenter with some background in carrier current. He is a believer in the AM-25. Install coils L4 and L6 opposite to the instructions. That is, install them in direct contradiction to the kit’s instructions for the orientations of the coils set forth in the Ramsey manual at assembly steps 67 and 72 (indeed in utter defiance of the admonishment that says, “it is vitally important that you properly install this part!”). So now the 8-turn end of L4 will go to C18, and the four-turn end of L6 will face R16. This alteration alone will enable the AM-25 to operate at higher power. Protect L6. Wind it on the binocular ferrite form provided, as instructed, but, prior to winding, put some extra insulation, such as spaghetti tubing, inside the form’s double holes. This prevents the wire from shorting against the ferrite, which is likely to occur as, in the process of winding, the wire’s insulation gets worn off. Ramsey does not warn you about this problem. Replace the coil form for L4. This coil will be handling more power now, perhaps 25 watts, and needs to be wound on a larger form with a heavier conductor. The appropriate binocular ferrite form is part no. BN-73-202 from Amidon. Omit the low-pass filter, that is, L1, L2, and L3 and all of the associated capacitors. This filter circuit only adds complexity, while limiting your ability to tune the rig. It is a feature intended to imitate circuitry in high-power transmitters, but it is just an inappropriate gimmick here, insists George. Insert an ammeter. You cannot tune a transmitter without one. 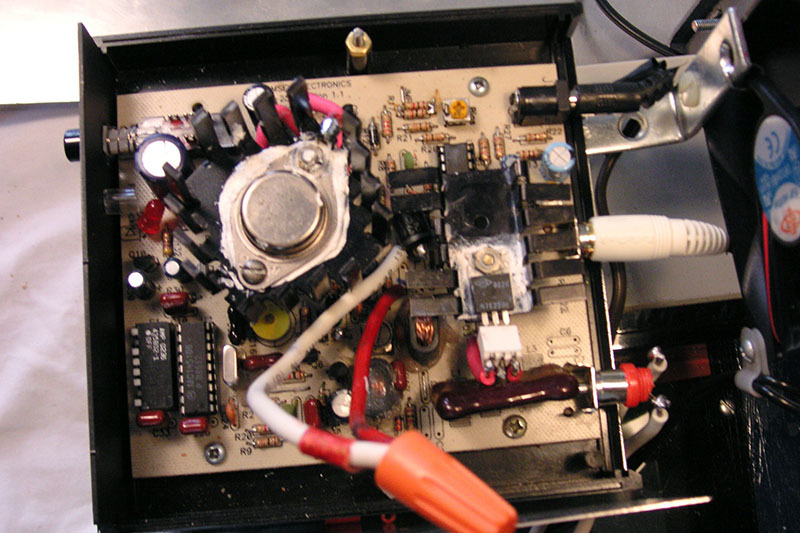 Place a 0-5 ammeter between the power supply and that 6-amp modulator diode. This will measure the flow of current through the MOSFET. The ammeter reading tells you plenty about how effectively you’re tuning the transmitter to its loads; without it you are blind. The kit’s instructions would have you connect the AM-25’s RF output to a little wire antenna, the grounded side of the output connected to an earth ground. The instructions also suggest a tuned loading coil in series with the antenna. Such an arrangement, however tuned and regardless of antenna length, results in only a negligible amount of current flowing through the final transistor. Instead, I ran the AM-25’s output into a primary coil with a wire length of only ten feet, almost a dead short in terms of ohmic resistance. A low-resistance load is the simple secret of pulling some real amps out of the humble AM-25. Your meter will register 2 to 4 amperes. (Of course, the above enhancements, including the fan cooling, are necessary in order to shoulder that increased current.) The potential at the 2396 will be 5 or 6 volts. Power, then, measured at the 2396, could be 12 to 24 watts. This is just the energy dumped into the energy-enhancing Tesla-style tuning tank, which is the transmitter’s ultimate final. The low frequency of the AM band allows for a powerful tuning “tank”view of tank of Tesla-coil proportions. (Overall, building for the lower frequencies means bigger components and allows circuitry that is less uptight than when building for short wave and frequencies above.) The photo shows the tank coil. The block diagram shows the complete circuit. The tank coil’s secondary is six inches long and space-wound with 60 turns of #18 enamel-insulated magnet wire. My coil form is acrylic tubing, but you can use white PVC irrigation pipe. The primary consists of just three turns of heavy, well insulated wire. 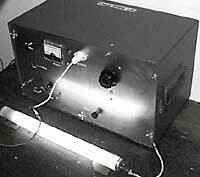 I used a #16 stranded high-voltage test wire rated 15 kilovolts. Wind it directly onto the primary coil in the same direction as the secondary. The space winding of the secondary coil reduces capacitance and enhances heat dissipation. A good way to space-wind a coil evenly is to cut a groove in the plastic form on your lathe. You don’t have a lathe? Neither do I, so I used string for separation. The finished coil, string and all, is then soaked with several coats of a clear acrylic spray like Krylon (this task performed outside or in some safe, flameless, sparkless, well ventilated space). Consider yourself to be in high-voltage-land as soon as signal exits the dainty AM-25. Hence the 15-kilovolt primary wire, the heavily insulated secondary (which is what resonantly multiplies the potential), the high-voltage variable tuning capacitor across the secondary, the insulative chassis, and also the use of high-voltage wire throughout the output system, inside the transmitter and out. When you build for high voltage, you get high voltage. Current in the antenna is valued in conventional radio, but Tesla idealized high voltage (and sudden pulse). The block diagram shows my old battery set-up. If you use a power supply like the recommended Triplite PR-7, disregard battery, charge, aux, and storage capacitor in the diagram. Across the secondary goes your air-variable capacitor, rated 3 – 600 pf and ideally 1 – 3 kilovolts, the higher the better in both respects. A high-voltage transmitting variable capacitor? You say that you have never even seen such a marvel? Not surprising, considering that even low-voltage variables are almost completely out of manufacture. The acquisition of high-voltage transmitting variables is an antique quest, but feasible if you know some commercial sources. (See Parts List for suggestions.) Additional transmitting variables are useful in tuning the transmitter to the power lines. Beyond circuit board and coil specs, the details of construction are left to your own ingenuity. 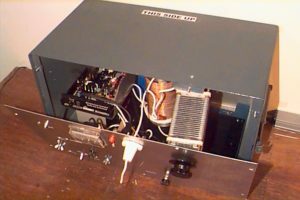 A metal enclosure is a good idea for any transmitter that might emit unwanted harmonics or spurious radiations. Mine is a test-instrument case, a very lucky $15 score from R5D3 Surplus, to which I attached an aluminum front panel. The case is connected to ground. Aerial transmitting should be be possible with this rig, but I’ve never tried it. Recommended is carrier-current transmitting over the power lines. Carrier-current can be effective for low-power closed-circuit community broadcasting within an apartment house, a neighborhood, a college campus, or even a small town. Carrier-current technology is an option for an AM transmitter, but FM frequencies are way too high to conduct resonantly into such a big load. In carrier current transmitting, the lower the frequency the better, which is why my rig is at 660 kc. The best frequencies, however, are well below the broadcast AM band. Tesla said that “radio is conduction.” The earth is a great conductor, especially of the lower frequencies. Another good conductor is copper wire. Power utilities transmit signals over their own copper lines. Called power-line carriers (PLC’s), these telegraphic signals communicate among generating stations and substations at ideal frequencies below 300 khz. During WWII, amateur short-wave was outlawed and all ham activity was allocated strictly to long-wave carrier-current over the power lines. The hams developed the equipment to do the job. (The ham carrier-current technology is set forth in the ARRL Radio Amateur’s Handbook of 1944, if you can find a copy. Carrier Current Techniques by Ernest Wilson is an extensive treatment of the subject that is more recent but also out of print. Transmitter output is conducted to the power lines via isolating capacitors rated for high voltage. legal? Apparently, the carrier-current mode may be legal, or at least it may be extra-jurisdictional. Can the FCC have jurisdiction over power-line communications if it has no jurisdiction over cable? And there may be latitudes implicit in Part 15. Anyway, the carrier-current mode should be more legally defensible than any aerial mode, especially if the signal is not detectable over 250 feet from the power lines. Carrier-current can be a closed system, relatively inconspicuous, and noninterfering. Utility transformers can choke signal. Any frequency over about 300 khz can be choked out by the nearest pole transformer, a challenge to AM-band carrier-current transmitting at 550 to 1750 khz. This is especially true when you send signal through the hot line, as opposed to the neutral. The scheme by electric utilities to send you broadband over power lines (BPL) at 1.7 to 57 mhz necessitates special transformers with filters that pass all those frequencies through (and may incidentally pass through a high-end AM band signal or maybe even a low-end FM). Of course, the lines themselves will propagate signal (and harmonics) like antennas, which is why BPL bodes disaster for hams, short-wave listeners, CBers, police and many other communicators in that huge chunk of spectrum. If the FCC comes after you because your carrier-current signal is propagating too far off the lines (250 ft. is the limit), you might remind the agent that his commission rubber-stamped a new mode of generalized interference called BPL. The FCC goes after pirates on the grounds of interference, but most AM radio interference is from inadvertant sources — like motors, chargers, light dimmers, and the new soon-to-be-mandatory compact fluorescents. These interferences the FCC takes little interest in supressing. So with carrier current you can expect to be squelched at the pole pig, but not necessarily. George Clark reports experiments where carrier current signals got all over town. In fact this was the case with carrier-current AM at my own college radio station (WRCU, Colgate). How you connect to the lines and how you ground the system can make a big difference. Ideal is to create a giant loop through the lines that returns to transmitter through ground. There is a shock hazard possibility from AC line energy passing from the wall socket back through the isolator capacitor (the larger its capacity the more so). If you interpose yourself between plugged-in isolator and ground, you may experience that energy, so get the ground connection completely established before you plug in the isolator. There is also an RF burn hazard in the transmitter’s own enhanced output circuit, at the variable capacitor, for example. Independent grounding. Earth-grounding is critical. Ground the transmitter to a cold-water pipe or some other earth ground. (Tesla’s is a grounded radio.) If possible you want to get a giant loop between power-line connection and ground. A building’s electrical system may be grounded nearby, allowing only a loop too short (as indicated by reading on your VOM only a negligible ohmic resistance between third-wire ground at wall socket and another ground point). Then you must try to establish an independent ground, either by sinking rods into the earth or by connecting to some independently grounded metallic element of the structure or even to grounded elements in adjacent structures. My first carrier-current experiments were conducted in a 60-unit central-city apartment house with power lines and transformer underground, a most frustrating situation. No resistance was measurable between third-wire ground and the plumbing or any other conductive element of the architecture. No big loop being possible, signal could saturate the building but not get outside. A subsequent location was conventional suburban (power lines on poles, service-drop to house directly from a nearby pole transformer). The handiest conductive element I could connect to was the sheetmetal ductwork at a hot-air floor vent. (This connection testing negative for ground, I wired the basement furnace ductwork to a ground clamp on a nearby cold water pipe.) Finally an independent ground! Neutral loading. The suburban hook-up worked best with the isolator wired to the white neutral line. Neutral loading can be an effective way to sneak around those signal-squelching transformers on utility poles. Apparently this is what happened, because my signal now covered at least 30 square blocks, this with the transmitter running at only 15 watts, as measured at the power FET. (Only if I wanted to shrink the range, I would connect to the hot, black). Two weeks after my successful test, the house was switched over to the Smart Grid. An electronic digital meter capable of being read remotely replaced the old kilowatt-hour meter at the service drop. The implications for carrier-current? My reading in the literature available from the meter manufacturer, the utility, Wikapedia, etc., did not hint at any serious implications, but this would have to be verified experimentally. To trace your signal, use a portable AM receiver of superior selectivity and earphones. Lock on to your signal, turn up the volume, and walk (don’t drive) around the neighborhood. Signal may be booming close in but fade quickly down the block. You may hear it only at service drops. Then you can guess that signal is getting into houses. In between drops, the signal may fade out completely and alien stations may even creep in, but it’s still there up on the power lines. Signal will also be detectable at power poles that have conduit running down to ground. Tune, tune, tune. 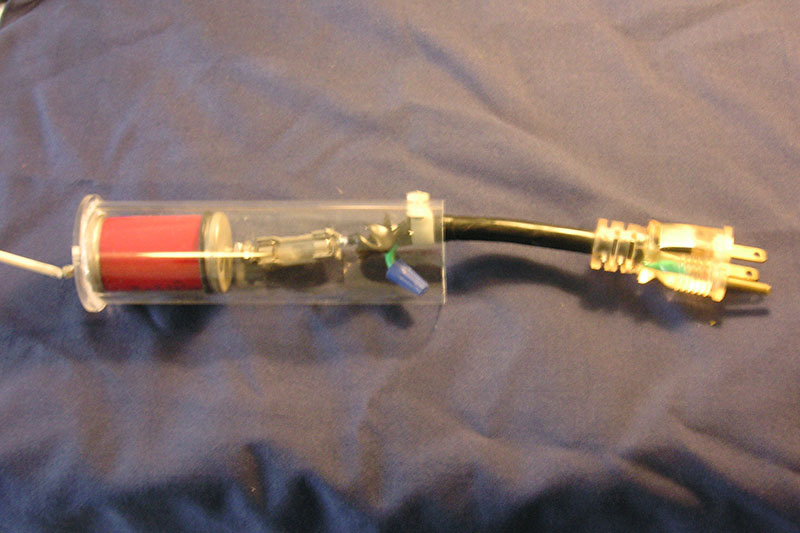 Test for output with a florescent tube connected between output terminal and case ground, as shown in the introductory photo. For field testing, tuning with a field-strength meter and oscilloscope are helpful, as is the installed ammeter, and so is a test receiver. Your scope can be a cheap, primative 2-megacycle. Plug your transmitter isolator into an unbusy house circuit. An example of a “busy” circuit is the one in my lab that bristles with signal-squelching wall warts, variacs, and even a brute-force line filter. Try to tune the whole electrical system to resonance with an additional external high-voltage variable capacitor placed between transmitter output and ground. (My 30-block experiment had the advantage of a huge 1000-pf high-voltage variable capacitor.) Also you may put another of your many high-voltage variables in series with ground, and maybe yet another in series with isolator, and maybe a variable inductance in there as well. Then you turn this knob and that, while listening to the receiver, and while eyeing the ammeter for a dipping, the field-strength meter for a peaking, and the scope for a steep well-shaped wave trace. However, having harmonized all circuits to perfection, you may return later to find that tuning has slipped drastically out of frame. This can happen as people turn electrical loads on and off. A carrier-current college station (WMUC, AM 650, University of Maryland) says on its website that it had tried all kinds of tuning, and, in frustration with the instability, finally simplified the relationship to the lines with just a .1 mfd, 1 kv isolator to the hot, and that was it. AM-25 kit. Ramsey, ramseykits.com, 800-446-2295, $99.95 (often on sale at $89.95). Power supply. 12-15 VDC, 6-10 amps, Tripp Lite PR-10, 13.8 volts, 10 amps, from Mouser, mouser.com, (800) 346-6873, $79. Power MOSFET. NTE-2396, from your NTE dealer $4.50. Heat sinks. TO-220 and TO-3 types. Fan. 3-inch muffin, 12-volt (All Electronics, allelectronics.com, $3). Power resistor. for fan, 75-ohm, 15 watt. Optional. Diodes. 6-amp, 50-volt, 1-amp, 50-volt. All Electronics. Binocular coil form. Amidon BN-73-202, from Alltronics (alltronics.com, 4/$3.50) or Amidon (714) 850-4660. Ammeter. 0-5 amps, All Electronics, PMD-5A, $12. Tank coil form. 3″ x 6″, PVC tubing or acrylic from Tapps Plastics. Magnet wire. #18, enamel insulated, Alltronics. Isolator: fuse block and power cord (All Electronics). Nylon wire clamp (hardware). Acrylic tubing (Tapps).